Bucknell University Press’s original Irish Writers Series began in the 1970s under the editorship of J.F. Carens as a way to promote 19th and 20th century Anglo writers whose works deserved monographic exposure. The series published its first books in 1970, exploring the likes of Sean O’Casey, James Clarence Mangan, Standish O’Grady, and W.R. Rogers. The series ended in 1978 with a volume on Thomas Davis. 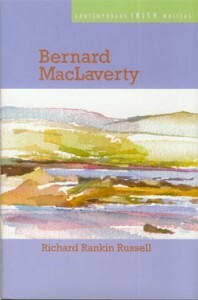 In 2009 came a reinvigoration of the series–the Contemporary Irish Writers Series published Richard Rankin Russell’s Bernard MacLaverty as its first volume. With Professor John Rickard as general editor, the serie s continues the tradition of the monograph format, offering new exposure to and insight on modern-day Irish writers. 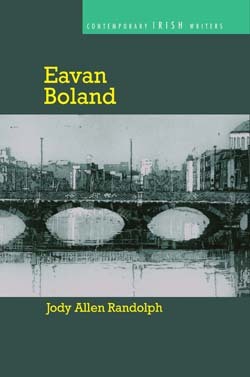 John Rickard insists that this approach “allows for thoughtful and in-depth treatment of the careers and styles of these important authors.” These authors’ works are influential and expansive so to even begin to speak to the richness and breadth of their careers requires an involved examination of their lives and legacies. The format and selection of Irish authors to profile is a collaborative effort between Rickard, the series editor, and Greg Clingham, the Press’s director. The cover images for the books are chosen from the works of Irish artist Gráinne Dowling. Dowling works closely with Rickard and Clingham in order to provide and select pieces that suit books in the series. In being asked to supply art for the first volume on Bernard MacLaverty, Dowling recalls that she was “delighted” at the prospect, having connected deeply with MacLaverty’s work. Dowling recalls a particular fondness for MacLaverty’s “short stories which pierce the heart.” The piece used for the MacLaverty book took Dowling a mere four hours to complete. Other works, though, can take much longer–the piece for the Eavan Boland cover that depicts the bridge over the River Liffey took about 4-6 weeks to be completed. Dowling’s artistic process is a combination of culture and environment. While she spends most of her time in Dublin, she enjoys returning to other areas, especially West of the Shannon. These locations attract Dowling due to their special skies, sea, and people. In order to gain inspiration for her drawings and paintings, Dowling immerses herself within natural areas. Her process is as follows: “I walk around a landscape or city scape until something grips me. This can be a sudden shock or a slow perception of something. I then begin to see. I start and if after an hour to two I find myself no l onger excited by what I am doing I know it won’t work.” In order to remain invested in the work, and eventually be able to complete it, “the excitement must last” throughout the process. John Rickard hopes that as the series expands it will be able to incorporate a wider scope of individuals, including writers such as Ciarán Carson, Nuala Ní Dhomhnaill, Paul Muldoon, and Colm Tóibín. These volumes would complement the books that exist in the series currently, as well as align with the forthcoming works on Medbh McGuckian, Edna O’Brien, Marina Carr, Neil Jordan, Anne Enright, and Seamus Heaney. The series will only continue to grow in depth and scope; through the varying degrees of collaboration between editor, writer, and painter, these interdisciplinary approaches to Irish literature add an exciting and reverent edge to the University Press. For more information about the series, visit the Contemporary Irish Writers series page.